The secrethistory of spies in space is about be revealed. The newdocumentary ?Astrospies? will delve into the U.S. Air Force?s Cold War-era spacereconnaissance program and its Soviet Union counterpart during a Tuesdayedition of the series NOVA on the Public Broadcasting System. ?We used tohave a joke in the program,? said former astronaut Richard Truly in a statement. ?That, one day, there was going to be a little article back on page 50 of anewspaper that said, ?an unidentified spacecraft launched from an unidentified launchpad with unidentified astronauts to do an unidentified mission.? Truly wasone of the first U.S. military astronauts selected for the USAF?s Manned OrbitalLaboratory (MOL) program in 1965. He later flew NASA shuttle missions inthe 1980s and ultimately served as the agency?s top administrator between 1989and 1992. But during the MOL program, his astronaut status and that of 16 othermilitary spaceflyers were classified as secret. ?That?s theway it was,? Truly said. Under theMOL program, two astronauts would launch atop a Titan 3 rocket in a spacecraftsimilar to NASA?s Gemini capsules, then conduct reconnaissance missions fromorbit using ultra high-resolution telescopes. The USAF scrapped the top secretprogram in 1969, but not before the then-Soviet Union devised its own space-basedspy platform: Almaz. Tuckedwithin the Soviet?s multiple Salyut space station program, Almaz arose in the1970s and was reported to include a cannon weapons system for use in space. Themilitary spaceflyers even had their own specialspacesuits. NASA discovered the blue space garments by accident in 2005after cracking open a long-sealed room at the Cape Canaveral Air Force Stationin Cape Canaveral, Fla.? Written byinvestigative journalist James Bamford and directed by C. Scott Willis, ?Astrospies?debuts tonight to rather fortuitous timing in the realm of space reconnaissance.The documentary chronicles the rise of the manned space espionage vehicles inthe U.S. and Soviet Union, as well as their downfall from robust unmanned spysatellites. Earliertoday, space officials in Russia and China challenged theU.S. by presenting proposal to ban future weapons in space. The proposal comesjust over one year after China tested an anti-satellite weapon that destroyedone of the nation?s older satellites. 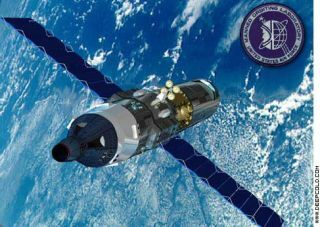 Meanwhile, U.S.efforts at space-based reconnaissance have been in the spotlight of late due toa defunct spy satellite expected to reenter theEarth?s atmosphere in coming weeks. ?NOVA:Astrospies? will air Tuesday, Feb. 12 at 8 p.m. ET/PT (check local listings). Click here for MOL programprofiles and more program information.